It’s time for another budget breakdown, but budget breakdowns can wait when there are muffins and memories to be shared. So, today, we shall share together and hash out budgets later. Growing up, my mom made an effort to feed our family well. Sure, there was margarine in our fridge and fast food pizza on Friday nights, but it was also the 80’s. Margarine was “the thing”. My childhood memories of my mom in the kitchen take me to pot roasts with finely-seasoned carrots and potatoes, and gooey homemade chocolate chip cookies that left melted evidence all over your hands. Food was enjoyed and celebrated in our home. Though she was beyond busy, my mom took time to teach me the joy of preparing homemade goodies in the kitchen. The pleasure of creating with your hands and the divine taste that comes from real ingredients. As an adult who spends many hours cooking and baking, my taste often goes back to my childhood, those times in the kitchen cooking with my mom. Parents, if you want your kids to have a good relationship with food, get them in the kitchen and create joyous memories together. I promise, someday they will grow up and reap the benefits of a healthy and joyous food legacy. The memories you make now, will always be with them. Every week I look forward to a few overripe bananas on my counter. Those bananas, with their little black spots trigger memories of my mom. She makes a mean pot roast and to-die-for chocolate chip cookies, but her real specialty, the one I hold most dear in my childhood memories, is banana bread. My mom’s banana bread is so ingrained in my taste buds, at one point, I decided I simply couldn’t eat anymore. The thought of another piece of banana bread was too much to handle. We ate a lot of banana bread growing up. Specialty, remember? Sometimes you just get a bit too much of a good thing. But, here’s the thing about memories, particularly joyous ones, you can’t stifle them forever. They keep coming back, longing to be relived and celebrated. Today, I look forward to those memories with every sight of overripe bananas and of course, my mom’s surprise banana bread deliveries. 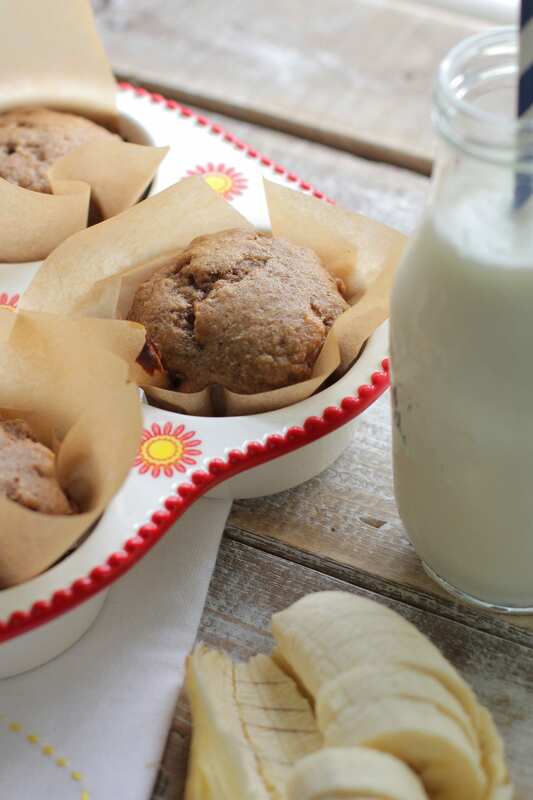 These banana-nut muffins were created with the loving childhood memory of my mom’s warm banana bread. Because I have very little patience for long processes (it’s amazing I even make homemade bread), I have a very difficult time waiting an hour for the goodness of moist, perfectly-divine smelling banana bread to come out of the oven. Muffins are my solution. Patience may also be the solution, but I’ll stick with muffins for now. 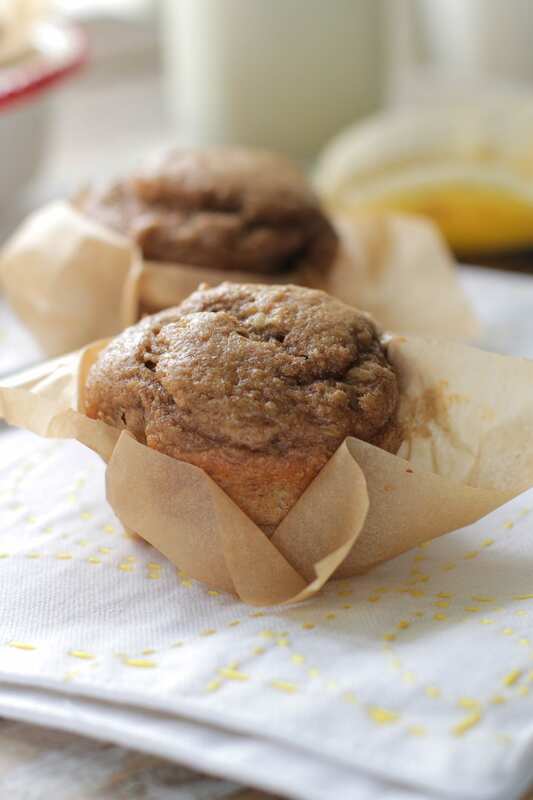 All the goodness of banana bread in one little domed muffin. Sweetened with honey and made with creamy yogurt, these muffins delight the senses and capture childhood memories. 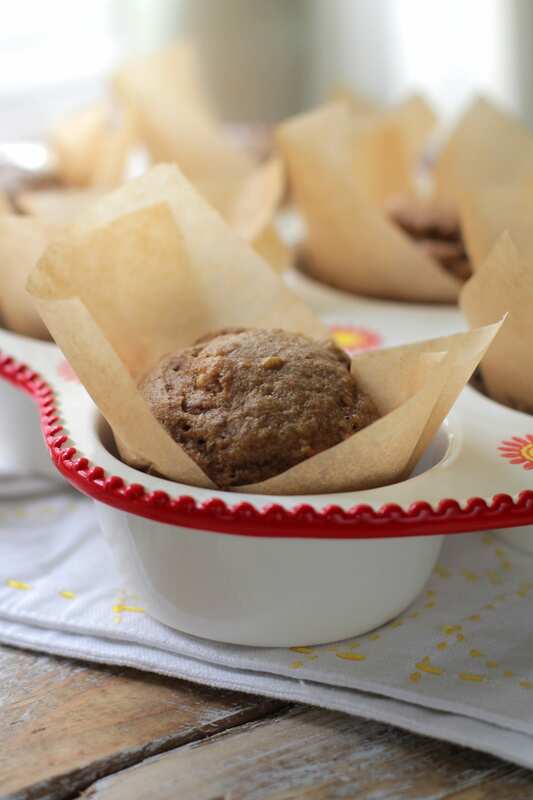 All the goodness of banana bread in one little domed muffin. Sweetened with honey and made with creamy yogurt, these muffins delight the senses and capture childhood memories. In a large bowl, combine the flour, cinnamon, nutmeg, salt, baking powder, and baking soda. Set to the side. 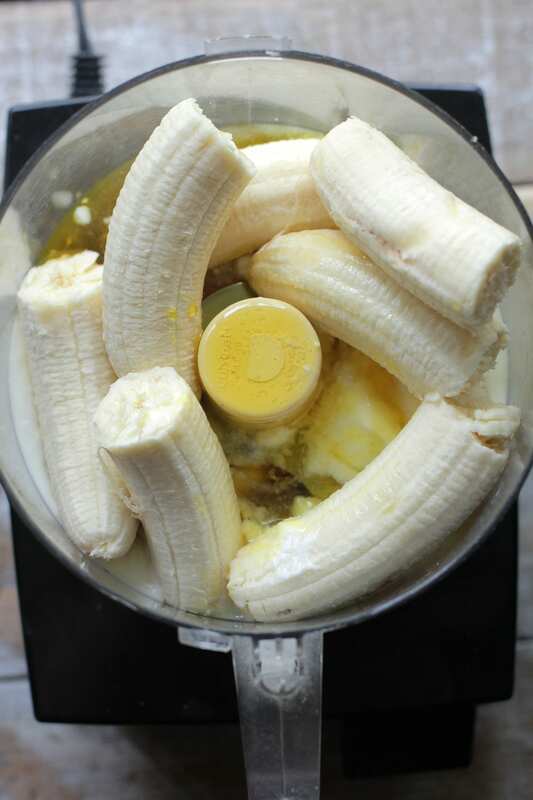 In a food processor (I use this one), add the bananas, yogurt, honey, vanilla, and eggs. Pulse together. Add the wet ingredients in the food processor to the dry ingredients. Mix together. Pour the batter in muffin liners (I use this parchment paper, cut into squares). Bake for 25-30 minutes. Makes 18 muffins. not everyone has a food processor, can recipes that call for one, be put into a blender or use a hand mixer? Hi Donna, A blender would work very well for this recipe. I live in a country where it is I M P O S S I B L E to find sprouted flour. It seems like this trens hasn’t arrived in Europe yet. I usually soak everything that has whole grains but I actually haven’t transformed a recipe yet. What do you think? What (ACV etc.) and how much of it do I need for soaking? Hi Bettina, I don’t think this recipe would soak well, but you could use a regular whole wheat in this recipe. Hi Kristin, So excited to try your recipe! Approximately what size square do you cut your parchment for a standard muffin tin? I always thought I could do that, but kept putting off figuring out dimentions for optimal performance. 🙂 The tulip papers are so cute but more than I’m willing to pay for muffin papers. I’ve just baked these today, some are still in the oven. Thanks so much for posting a muffin recipe that does not call for tonnes ….. 😉 ….. of oil and/or sugar, they’re delish. I couldn’t wait and had to taste right away. Will be a go to recipe for me now. Thank you so much, Carey! I’m so glad you enjoyed the muffins. Enjoy!!! Yep! Cutting the long strip of parchment paper into three worked perfectly! Thank you! I also found folding them in half the opposite way the papers curled help get them into the cup. Awesomeness! Bethany, I’m so glad that worked for you. Woohoo! I am a newbie to baking. This recipe came out awesome.. My whole family enjoyed the muffins. I am goin to bake some more now. Woohoo, Mali! Enjoy the delicious muffins! Thanks for this recipe my 6 year old loved them!! Do these freeze well? Hey Adria, You’re welcome. The muffins keep wonderfully in the freezer! Hey Priscilla, Thank you so much. It’s so great to hear that you love Live Simply ;). I’m not sure about applesauce, it’s worth a try! Another option is to use a coconut milk yogurt. Let me know how it goes! How much yogurt do these need? For some reason it won’t show up anymore on my lap top. Thanks! I am in love with this recipe! My four-year-old daughter enjoyed making it with me and I was very pleased with the final result. 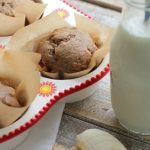 These muffins are a perfect breakfast item for my girls and I happy to serve them knowing they are not filled with sugar. My new go-to! Thanks! Just wanted you to be aware that your Amazon links are not working. Tried to see what food processor you use. I only have a mini and using a blender didn’t work well. My boys still enjoyed the muffis!